Is there a Double-Standard for Commits at MSU? Unfortunately in the new age of high school recruiting that word of assurance given to a school by a recruit is as solid as a jello out of its mold and on July 24th three-star offensive line recruit Gavin Cupp of Leispic, OH learned a tough lesson as his scholarship offer was rescinded by the Michigan State Spartans football program. It is being speculated that even though Cupp committed to the Spartans back on May 14th, there are some that say that he may not have been 100% solid with the Spartans. This past Friday he participated in the Ohio State Buckeyes “Friday Night Lights” football camp and that’s where things fell apart. 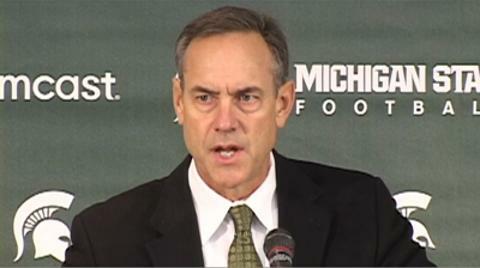 Head coach Mark Dantonio, like former University of Michigan head coach Brady Hoke, supposedly takes that word “commitment” very serious and because of Cupp’s deception felt that he could not rely on the young offensive lineman to honor his word — especially if the in-state Buckeyes were to offer Cupp a scholarship. So rather than allow the young man to string the program along Dantonio decided to cut ties early and regroup. It did not take long for the Spartans to find a potential replacement as later on that evening a scholarship offer was given to fellow Ohio lineman A.J. Arcuri — who has since “committed” to be a part of the 2016 recruiting class. It is good that D’Antonio is a man of his word, but you have to wonder if he would have been so quick to pull the scholarship if it were a higher rated recruit who had made an unauthorized visit and not a mid-level ranked offensive lineman. What if it was Auston Roberson, a top-10 rated defensive end from Indiana, that decided that he wanted to visit Notre Dame for a camp?Or if it was four-star safety Demetric Vance of Detroit Cass Technical High visiting a school down south to participate in a camp… but he did. According to scout.com, Vance took a visit down to Knoxville in June to meet the University of Tennessee coaching staff and participate in their camp. Who is more apt to renege on his “commit”; a small time recruit taking a camp visit in hopes of catching the eye of the in-state school — Cupp left Columbus without an OSU offer — or a top 15 rated player at his position already saying that he will take visits to other schools to see things for himself? Coach Dantonio has to be careful so that this new-found recruiting success — the Spartans currently have the No. 4 rated class in the nation (scout.com) — doesn’t create a double-standard in the eyes of future recruits and their parents. But then again this is the same coaching staff and athletic department that recently reinstated a player who was originally suspended for brandishing an illegal weapon on campus — by the way he just happens to play a position that is looking to replace a starter. So it is starting to seem to some that you are free to do as you feel in East Lansing as long as you are committed to helping the team win, but if not you better toe the line or risk being replaced.